ON APRIL 19 when the plenary of the UN General Assembly met in Washington to discuss road safety, the message was loud and clear: countries must act fast to save at least five million lives and prevent 50 million serious injuries during this decade. With road accidents becoming a major public health issue world over, the UN had set the target last year as part of its Decade of Action for Road Safety 2011-2020. To achieve the target, the action plan suggests member nations to improve road safety management, provide safer roads and mobility, safer vehicles, spread awareness and improve post-crash response. The UN says 90 per cent of the people killed in road crashes every year are from low- and middle-income countries. The April 19 meet was to assess the progress made so far. While several countries have initiated efforts, which include advancing national legislation, improving surveillance and public awareness, to ensure road safety, the task before India is humongous. India is the accident capital of the world; one person dies in a road accident every four minutes, as per the 2010 report of the Union Ministry of Road Transport and Highways. Over a million people were killed in road accidents between 2001 and 2010. Non-profit International Road Federation says India suffered a loss of Rs 1 lakh crore in 2010 due to road accidents. 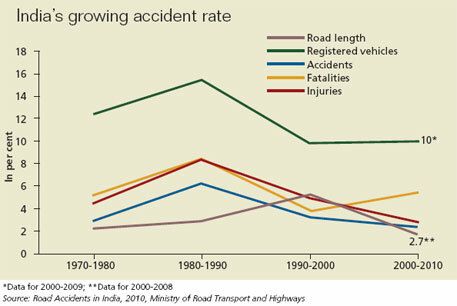 What makes road accidents a public health emergency in India is the boom in road infrastructure and the ever-increasing number of motor vehicles. In the past three decades, road network has multiplied thrice; accidents have increased by 4.4 times and fatalities by 9.3 times (see infographic). But the emergency care infrastructure—ambulance service and trauma care hospitals—has failed to keep pace with this. Tamorish Kole, vice-president (north) of the Society for Emergency Medicine, India, says there are plans and programmes in the country to improve the status of emergency care for accident victims but they are not properly implemented. In May 2010, the government introduced the National Road Safety and Traffic Management Board Bill in the Lok Sabha. But the Standing Committee on Transport, Tourism and Culture suggested the government to withdraw the bill, saying it needs improvement. A major shortcoming in the bill is that it recommends improving road safety only on national highways, while around 70 per cent of all accidents occur on roads other than highways. The 11th Five Year Plan envisaged a network of trauma centres along the Golden Quadrilateral, a highway network connecting the largest metropolis of Delhi, Mumbai, Chennai and Kolkata. By the end of the Plan period, most of the trauma centres are in different stages of implementation. Kole says more than setting up trauma centres along highways, the plan to integrate the care system with existing hospitals will serve the purpose better. This integration is envisaged in the 12th Plan period. But several other experts say road safety cannot be managed with just ambulances and enhanced medical infrastructure. In the past few decades, trauma centres have been upgraded and pre-hospital care like ambulances have increased significantly. “Still we see so many fatalities,” says Bikash Mohapatra, founder secretary of Forum for Prevention of Road Accidents, Odisha. Amit Sengupta of People’s Health Movement, a coalition of organisations that works on public health, says, “Emergency care cannot be provided in isolation.” In the absence of an adequate public healthcare system, accident victims often approach private hospitals where they end up paying dearly. Even though it is illegal to refuse emergency medical care, there are instances when private hospitals turn away accident victims who do not seem to be capable of footing the bill. There is also a need to increase the trained staff in trauma management in the country. The National Disaster Management Authority along with the All India Institute of Medical Sciences’ Jai Prakash Narayan (JPN) Apex Trauma Centre has taken up extensive training programme to fill this gap. “The training process is slow and would produce sufficient staff in 10 to 20 years,” says Mahesh C Misra, chief of the trauma centre. The strategy to avoid accidents lies in enforcing road safety measures like wearing helmets, not talking on cell phone while driving and not driving drunk, he adds.